Coventry Rugby returned to the Greene King IPA Championship with a thrilling 20-15 comeback win at Butts Park Arena on Saturday. 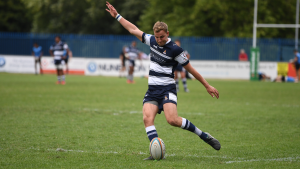 Fly-half Will Maisey scored the decisive penalty which took the lead beyond the reach of Jersey and earnt the Blue and Whites a heroic win in Round One. “The normal cliché things, I wasn’t really thinking too much, I was just in the moment,” said Maisey. Maisey was full of delight at the final whistle and the 25-year-old revealed just what was going through his head at the moment the decisive penalty was called. “No too much to be honest, I was just thinking about sticking to my system, don’t change anything about my kicking style and just hit it as I normally hit it, it’s any other kick. “I was a bit annoyed about that last one, I probably thought about it too much and I probably let myself down a bit, but we got the win which is the most important thing. Despite playing 40+7 in the first period, as well as receiving two yellow cards in the space of three minutes, Coventry held out until half-time and Maisey believes the side showed great character in defence during that period. He said: “We showed great character, it was very tough, I can’t lie. You looked up and you had no one outside you but it was just a lot of defending but we dug deep, and I think which we grinded out which was great. Cov saw out their opponents after trailing by 12 points at the end of the first period but the side managed to soak up the pressure and score points from strong spells of possession. Maisey scored ten of Coventry’s 20 points and the in-form half-back admits the match was ‘tough’ but believes the side have plenty to work on going into the Cornish Pirates match on Sunday. He said: “It was tough, especially when we went down in that first 40 minutes when we went down to 13 men for ten minutes, that was really physical and really tough, but we ground it out and I thought we played really well in patches. “The most pleasing thing is that we can still improve, we have plenty to improve on from that and we can go up another gear, which was the most pleasing thing about is today. After a winning return with emotions running high, the 25-year-old paid tribute to the fans that have carried the team on occasions and the fly-half believes that the side need to make Butts Park Arena a ’fortress’. “Our fans are probably the best in this league as well. They were the best in National One and they have carried that through and we have gained a few more supporters from last year and you can hear the noise, it’s absolutely immaculate. It’s great to play in front of and without them we couldn’t get the win. “It was a fortress last year. We have gained some great momentum coming through pre-season and again the fans count as extra players to be honest.